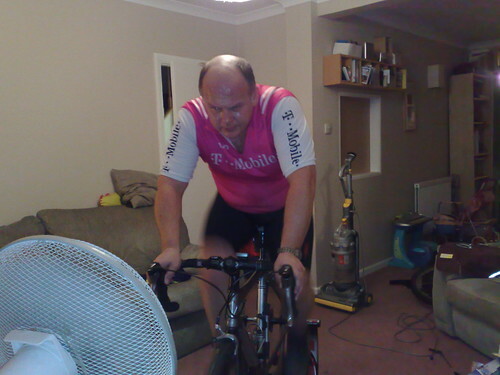 Turbo training in front of the TV, originally uploaded by mike1727. Autumn's here and with it the waning of the light, so evening rides are going out of the window, to be replaced by nights in front of the TV.. I'm aiming to increase my daily commute riding up to about 1 hour 30 3 days a week using the turbo for 50ish minutes in the evening, trying to find a beginner's training guide and stick to it. Boredom is the issue on a turbo so I'm loading up my phone with podcasts- Podrunner is good music with podcasts at certain BPMs and intervals too. My own intervals can wait for a bit. Last night's training left me with tirde legs today.